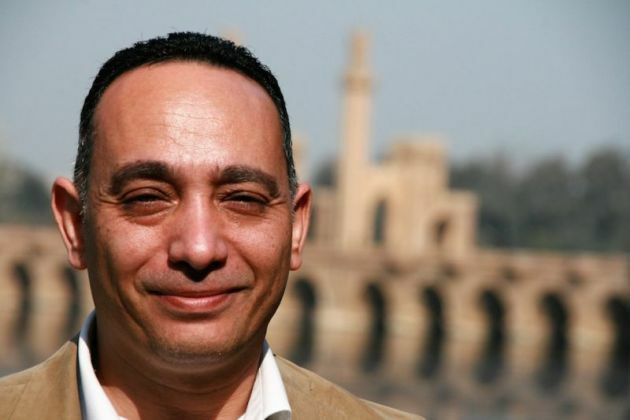 Freddy Elbaiady has made history as a politician. But what counts most for the 46-year-old Egyptian doctor is his work at the Salam Medical Center (SMC) in El-Qanatir, north of Cairo. The bridges between Christians and Muslims that are built through this work are sustainable even in times of crisis. Freddy Elbaiady has many professions and ministries. He is a respected radiologist in Cairo, runs a medical center in his hometown El-Qanatir, is a member of the local church council, and is involved in Evangelical church politics in his capacity as one of the members of the Supreme Council of Protestant Churches in Egypt. To the wider public he became known in 2013, when he accepted an offer to join the Muslim Brotherhood dominated parliament as one of the few Christian members. TV news programs were and still are happy to invite him for discussions on interreligious coexistence, the role of the churches in Egypt and politics in general. No doubt, this man has influence and prestige. But if asked to talk about himself he remains reticent. His office in Salam Medical Center (SMC) in El-Qanatir has surprisingly very simple decor. No thick desk, no leather furniture to receive guests. Freddy Elbaiady receives visitors in a small room. In the rear part there is an examination table for consultation. He is content with the front as his office. Only the wooden nameplate on the small desk reveals his role as C.E.O. Elbaiady works at a large private hospital in Cairo, where he chairs the radiology department. From there, he arrives at SMC by around 3 pm, where he works until after midnight, often into the early hours of the morning. "I get along with little sleep," he says matter-of-factly. At the age of 25, Freddy Elbaiady founded the SMC. He was looking for a way to strengthen the coexistence of Christians and Muslims in his hometown of El-Qanatir. The local Presbyterian church where his father was pastor at that time had given him a few rooms to start. He began treating patients who had no money for high-quality health care. He also convinced colleagues to volunteer for a few more hours at SMC in addition to their paid work. Today, 65 physicians care for more than 30,000 patients a year. The hospital is open around the clock, seven days a week. It has been extended by several floors, has 12 beds, two operating rooms and other rooms for various medical specialties. El-Qanatir is a small district town of 50,000 residents north of Cairo. Here the Nile splits into two arms building the fertile delta. In the surrounding villages a 400,000 people more live. Life there is hard and is determined by day labor in the fields. Most of the streets are not paved. In the irrigation canals on the roadside the garbage is piling up. Donkey and horse carts cross the road more often than cars. Countless huts and small houses are lacking the windows and sometimes even parts of the roof. Families with many children often share one or two rooms. Egypt is one of the fastest growing countries in the world. Many challenges face the many people born in El-Qanatir and other similar districts. High quality education is unattainable for most people. Likewise, healthcare is very difficult to access. The government hospitals have very limited funds, and therefore offer extremely limited care options. Conversely, private hospitals offer high quality care, but at a cost that is unaffordable to 90 percent of the national population. At SMC different rules apply. Everyone is treated at the highest level, no matter how much he or she can pay for it. Many patients cannot pay anything. SMC is operationally sustainable to cover day-to-day costs. However, to cover the cost of construction, expansion and additional programs, SMC depends on donations. SMC is not just a medical center, Elbaiady points out. "It is a Peace Medical Center, a place where Christians and Muslims come together. Most patients are Muslims, as are many of the 65 doctors. They serve the poor with commitment. The vision of inter-religious peacebuilding that he has worked so hard to promote has received international support from many international organizations. The proportion of Christians around El-Qanatir is five percent which is lower than the national average of ten to 15 percent. The smallest church is the Protestant church with only 40 members. They worship in a small, humble church room behind the clinic. The path leads across the courtyard of the adjacent school. For Elbaiady this is a piece of home. Here he grew up, here he went to school. Today he is an elected member of the local church council, sometimes preaching in the main Sunday worship service. In the church, a small group of young people is preparing the next Sunday school unit. They greet Elbaiady like an old friend. For many years, he was heavily involved in church youth work. Today, due to his busy schedule, he has reduced his commitments, but still accepts invitations to speak to the youth. During his compulsory military service, he used his spare time to put together a collection of hymns. Elbaiady pulls one of the copies from a shelf and looks through it. He smiles and points to the pictures he found fitting for the songs at that time. "Apparently it is still used. How nice," he comments. The church was founded by Dutch missionaries. On paper, it still belongs to the so-called Dutch mission, one of the 18 Protestant denominations in Egypt, which are represented in the Supreme Council of Protestant Churches. The council is the official point of contact for all those who want to consult with the protestant church, known locally as the Coptic Evangelical denomination: politicians, political parties, authorities, other churches. At the same time, the council is channeling inquiries from the 18 Protestant churches to public bodies, such as applications for church buildings. Until two years ago, Freddy Elbaiady's father, Rev. Dr Safwat Elbaiady, was the president of this council. Today, the son, as one of the elected council members, plays a role in church policy-making. But Freddy Elbaiady is also present in national politics. He soon became well-known in El-Qanatir through his work at SMC. The National Democratic Party - the former party of Hosni Mubarak - wanted to appoint him. Elbaiady accepted. "It was an opportunity to bring the church's perspective into the public," he comments. In 2012, when the Muslim Brotherhood won the vast majority of Parliamentary seats, Christians became more and more discontent. The President requested that various groups, including the Protestant church, put forward candidates for the Senate. The Protestants suggested Elbaiady, among others, the President appointed him, and he accepted. Many couldn't understand him. Even good friends accused him of providing a cheap sense of credibility to the Muslim Brotherhood. He considered it a way to make the voice of most Christians and other opposition voices heard. "All sessions and thus all objections to legislative proposals were transmitted live," he says in a serious tone. His work as a parliamentarian did not last long. In June 2013, Elbaiady was in the first 9 MPs, who publicly resigned in protest of the government of Mohammed Morsi. The image of each of them holding a red card to tell the President to step down was shared a million times in social networks. This action was one of the sparks that ignited the second revolution. Today, Abdel Fattah al-Sisi rules the country. Elbaiady also voted for him in 2014. But he personally experiences how the president puts significant limitations on all civil society and political opposition. Elbaiady is now a Supreme Council member and general secretary, representing the northern district of Cairo, for the Egyptian Social Democratic Party, a party that strives for collaboration over confrontation. Nevertheless, one of the party leaders went to jail for a simple Facebook post. Others are no longer allowed to leave the country. In television and social media he has reduced his presence but still speaks out on boldly on important issues, despite the risk. His wife advised him not to comment on everything. She thinks that it would be a pity if one misunderstood post or comment would destroy all of the important work, and the bridges that have been built, between Muslims and Christians over the last 20 years. In the summer of 2013 it became clear how stable these bridges have been. Outraged by the fall of Mohammed Morsi, the followers of the former president were marauding through towns and villages throughout the country. They wanted to take revenge on those they blamed for the fall - the Christians. Elbaiady, who had publicly shown the red card to Morsi, was at the top of their list, along with SMC. "When we heard that some groups from the villages were marching towards El-Qanatir, the Muslim youth of the town came and formed a human shield around the hospital," he says, becoming emotional for the first time. "I had tears in my eyes when I saw that we were being protected by Muslims. At that moment I knew that no single minute was invested in vain."